What’s to be afraid of at St Paul’s? Walking through the ‘Occupy London’ protest at St Paul’s one evening last week, what struck me was not how large it was but how small – a small crescent-shaped areas around just one corner of the cathedral. Smartly dressed in a new suit, I could easily have been mistaken for a banker. But I encountered no hostility or abuse, and saw no aggression of any kind – indeed the Camp is a place of bookstalls, neat tents. The only raised voices I heard were an animated discussion between two Rastafarians about whether or not the Occupy London protest was on a par with the Tienanmen Square protests of 1989. I could see no graffiti – only posters tidily sellotaped up on the columns on the shopping arcade of the Post-Modern development alongside,Paternoster Square. Apart from some ordure left by a police horse on a pavement, I saw no rubbish, heard no loud noise, and saw no sign of access to and from the cathedral, or any other adjacent building, being impeded. City workers and Vergers in white tie from the cathedral walked by without any impediment. Just yards away from the tents, a sports retailer and a branch of an upmarket deli (called Paul, oddly) were trading as normal (so much for shutting down the capitalist system). So why has the protest prompted so much fury amongst some City types, and commentators like Sir Simon Jenkins (see http://www.thisislondon.co.uk/standard/article-24004611-this-camp-is-not-a-proper-protest—remove-it-now.do), with his ludicrous argument that the camp should move on now because it is “not a proper protest”. Presumably, the protest would only qualify as a “proper” protest, and the campers earn the right to stay, if they were throwing missiles at the police and the Cathedral. The tented city may not face the kind of violent clearance of Tienanmen Square 20-plus years ago, but the glee with which politicians like Deputy Mayor Kit Malthouse have fantasised about hosing the protesters down with “high powered sprinklers” brings more discredit on London than the protesters themselves ever will. The fact is the dignity and peacefulness of the protest has caught many institutions – the Cathedral authorities, the Corporation of London, and the right-of-centre commentariat – off-guard. The arguments in favour of the removal of the camp have had to resort to barrel-scraping to cover their short-comings, resorting to strictly legalistic arguments about ownership of land, and even– the last resort of the bureaucrat – Health and Safety. If the sole test of the validity of a protest is whether it complies with the exact letter of the current law, then just about every single protest on British soil in the last thousand years – the Peasants Revolt on Blackheath in 1382, the Suffragettes, the Chartists and the Levellers – would have been declared invalid. There is certainly an argument that such protest in effect privatises public space – people who wanted to go for a quiet stroll in St Paul’s Churchyard, or in Parliament Square, cannot now do so (although it has to be said that reaching the middle of Parliament Square is always a great achievement, so unfriendly to pedestrians its girdle of roads is). There is also a security argument – the permanent camp on Parliament Square, just across the road from the main entrance to the Houses of Parliament, is a clear security risk, which makes its survival after eight years all the more remarkable. 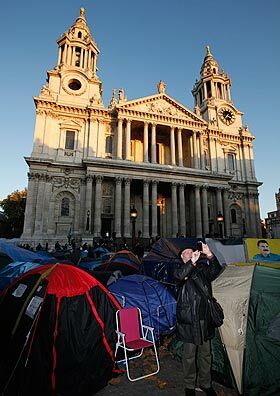 But at St Paul’s, the Cathedral has recanted its earlier argument that the camp was somehow a “Health and safety” risk that meant the cathedral could not safely open to the public. But this sort of “privatisation” by protesters is less insidious than the genuine privatisation of land which is considered to be public by its owners, who at the first sign of protest suddenly remind the public passing through that they can only do so with landowners’ permission. The fact that corporations can declare large parts of the City out of bounds to people they don’t like is very worrying – I was very disturbed to read recently (http://www.london24.com/news/politics/police_stop_protesters_occupying_london_stock_exchange_1_1091614 ) that someone taking photos in Paternoster Square, the new development juts to the north of St Paul’s, was asked to move on. Notices have been affixed to the area saying “Paternoster Square is private land. Any license to the public to enter or cross this land is revoked forthwith. There is no implied or express permission to enter any premises or any part. Any such entry will constitute a trespass.” A similar notice has gone up around the Canary Wharf estate, backed up by an injunction for good measure. There is also an argument that the protesters’ demands are confused, contradictory, or naïve. Many of the views espoused by the protesters are probably all three of these things. But the arguments put forward by the financial services industry to explain the recent Financial crisis have often been confused, contradictory, or naïve as well. If confusion and naivety justified the removal of a camp set up by the protesters, surely it could also be used as an argument in favour of the immediate demolition of much of the City of London – something not even the most extreme of the protesters are calling for. A little more humility and tolerance seems in order. I welcome the fact that the protest seems set to remain until Christmas. If it encourages us to think about why we are in the current economic mess, why it is worsening under the current Government, and why the right to protest needs defending more now than ever before, then I can live with the fact that the camp was not erected with the landowners’ consent. Live and let live.